Many moons ago I was a young slip of a girl with a pair of blonde pigtails and an AK47, because I embarked upon a short course in Forensic Anthropology at what was basically a military training university. As well as learning about cadaver dogs, how to identify bones and exhume remains, and even meeting the Queen of forensic palynology (yes there is such a thing – Google “Patricia Wiltshire”) I was able to go to the firing range and try my hand with several large weapons as part of the forensic ballistics module. It was fantastic! What was really incredible though is that it eventually led to me heading off to an island in the Venetian Lagoon for an excavation of skeletons at an old plague hospital. The island, not as well known back then as it is now, was called Lazzaretto Nuovo (A Lazzaretto or Lazaret is a quarantine station, and is particularly a maritime term). The dig was being led by one of the professional students on my course, Matteo Borrini – a forensic anthropologist from Florence – and as you can see from the below pic of us at the firing range we became good friends. I was honoured to be invited along. The island, which had a strategic role in the control of the Venetian waterways, was used to house victims of the plague around the 15/1600s, and was studded with mass graves. Quarantine stations like this were established to keep the diseased and the potentially diseased away from the living trapped in close quarters in the center of the city. I had the best and most surreal time there. It was summer and the lagoon was humid and full of mosquitoes, which gave the sensation that we were very far from home. We had to travel from Venice via boat to Lazzaretto Nuovo, and once there we couldn’t get off the island – supplies were simply brought to us. On the way there, we even passed the island Cimitero on San Michele (which is basically one of the only ways the Venetians could dispose of their dead: give them their own island as a cemetery.) The whole thing was perfect as the set of a horror movie: Twenty young adults, a plague hospital, buried skeletons and no escape…. Unfortunately for me the whole two weeks went by without any unusual activity, but what made the papers years later was the thing that happened after I was there: The Vampire. 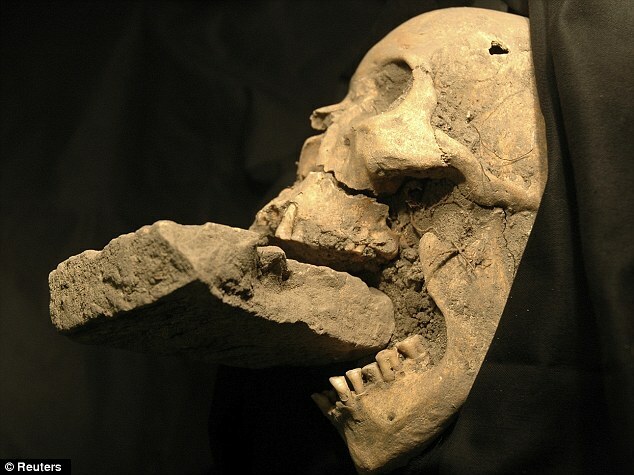 National Geographic described Matteo’s team’s discovery in this way: “The partial body and skull of the woman showed her jaw forced open by a brick (above)—an exorcism technique used on suspected vampires.” Of course it wasn’t really a Vampire but it was evidence that there had been a very real fear of vampires in the Medieval era, particularly as the process of bodily decay was misunderstood. In times of plague, when graves were often reopened to inter more cadavers, the unusual effects of decomposition were misinterpreted. Purge fluid, which is usually a dark brown/red in colour, can be forced out of the orifices of a decomposing corpse due to the build-up of gases – and this fluid looked just like dried blood encrusted around the mouth of the deceased, giving the impression they had been feeding. Also, due to bacterial decay, the burial shrouds of the dead would disintegrate over the mouths first causing the teeth to be bared. It was also believed that vampires spread pestilence (female ones in particular), because there was no understanding of epidemiology. 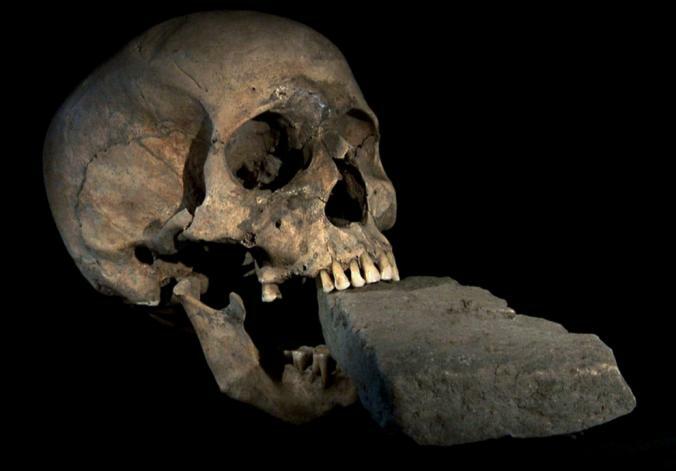 In order to combat these effects something inedible – such as a brick – needed to be forced into the mouth of the corpse to stop them being able to feed from anything else. This was commonly used as an exorcism technique in Eastern Europe at the time. As for me, I’ve only ever been on a few different digs (which I discuss in this post) because I focused mainly on soft tissue as an autopsy technician. However, it was a real honour to be a small part of what was to become a very famous excavation and a tale that I thought was particularly relevant to tell near Halloween. And for more information on possible medical reasons for the spread of the ‘vampire’ myth (as well as other monsters’ suggested origins) see my post on Halloween Medical Marvels and watch me talk about it on the Alan Titchmarsh show.